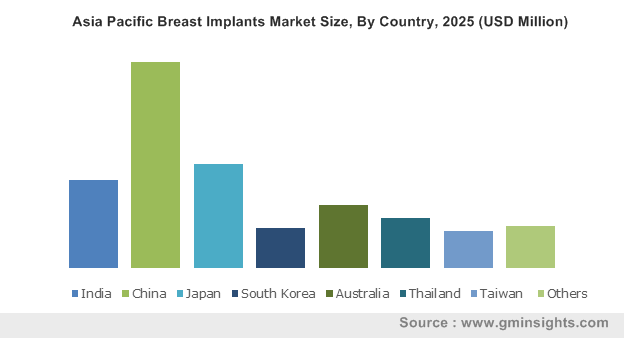 Breast Implants Market size was over USD 2,268.5 million in 2018, with growth forecast over 10.5% CAGR from 2019 to 2025. Increasing desire to look fit and attractive with growing age amongst women has resulted in a higher demand for the breast implant procedures. Growing trend of breast augmentation to maintain body proportion and restore breast volume will stimulate breast implants business growth over the coming years. Rising breast cancer incidence and consequential increase in mastectomy will serve as a high impacting factor for market growth over the coming years. Events such as early menarche, late natural menopause or no child bearing, increases risk for cancer due to increased levels of estrogen and progesterone. Growing awareness pertaining to availability of restoration option is leading to greater number of women opting for reconstruction procedures, that should stimulate breast implants business growth. Technological advances and improvements in the design, construction and fill volumes will escalate development of innovative devices causing less rippling or wrinkling of the breast implants. Increasing number of qualified and skilled plastic surgeons should further escalate industry demand for the product. However, high procedural costs along with other additional expenditures on medical tests, post-surgery garments and medications will limit breast implants industry growth over the forecast period. Also, re-surgery may be required sometimes for correcting appearance that will further increase patient expenditure. Additionally, risk of post-procedural complications may hamper industry expansion. 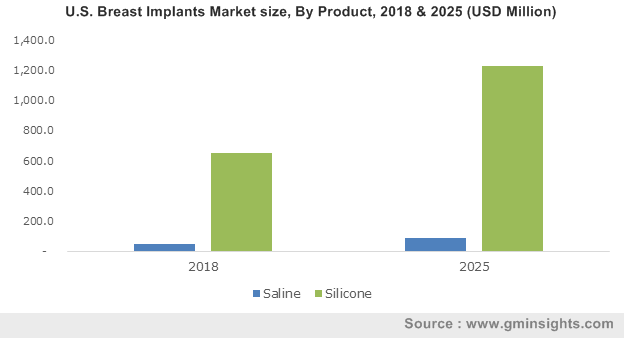 Silicone breast implants was valued over USD 2,150.0 million in 2018. Ability of the implant to replicate the feel of natural breast along with feature such as light weight increases its product preference. Silicone implants can be filled during the implant procedure as well as gives flexibility to adjust as per the requirement. Furthermore, reduction in visible wrinkling or rippling will impel segmental growth in the forthcoming years. Saline breast implants is estimated to witness considerable progress at 10.5% CAGR over the forecast timeframe. Low cost of saline implants along with requirement of smaller incision during the implantation process will boost the implants’ adoption rate. Capability of the implants to be filled and adjusted during the procedure providing scope for increasing or decreasing volume for improved breast symmetry will further stimulate the product demand. Round breast implants market held the largest revenue share with USD 1,966.2 million market size in 2018. High revenue size can be attributed to the ability of the implants to create round, soft and nicely proportioned breasts. Availability of round breast implants in a wide range of diameters and varying degree of projections permits greater flexibility in fitting to any women’s body type. Aforementioned features will drive the demand for round breast implants in the foreseeable future. Anatomical breast implants market will grow at robust 8.6% CAGR during the forecast period. In addition to aesthetically fuller and firmer look to the breasts, anatomical implants are also used for breast lift, restoration of lost breast volume after breast feeding and balancing asymmetries. Hence, increasing application of anatomical breast implants will spur the product demand, thereby boosting the market growth. Breast augmentation market dominated the breast implants market in 2018 with over 85% revenue share in 2018. Breast augmentation procedures are estimated to witness robust growth due to increase in number of women opting for the procedure. Short procedural duration and less complications will impel the demand for this breast augmentation procedures over the upcoming period. Breast reconstruction market is estimated to show significant growth at 10.5% CAGR in the forecast timeframe. Increasing incidence of breast cancer in global female population will drive breast reconstruction segmental growth over the forecast period. As per GLOBOCAN, in 2015, there were 1,55,000 new cases of breast cancer in Indian female population while 292,130 new cases in U.S. female population. Moreover, factors such as aging, personal or family history of breast cancer, exposure to radiation, obesity and consumption of alcohol increases the risk of acquiring the breast cancer, that will further drive breast reconstruction market growth. 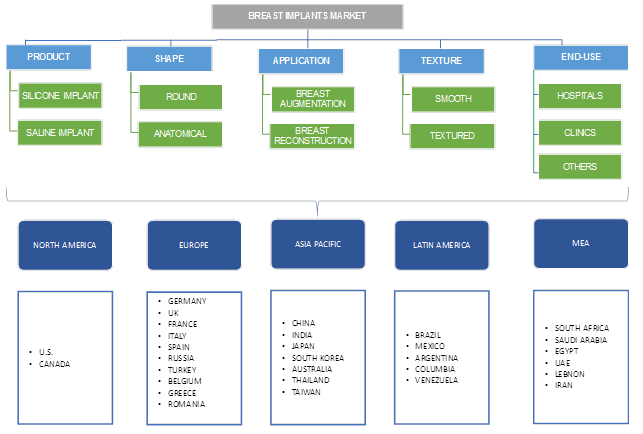 Textured breast implant market accounted for over USD 1,983.0 million in 2018. Textured breast implants have been developed recently for stabilization and reduction of capsular contracture. Attachment of these breast implants to the tissue capsule does not allow the implants to move that increases the preference for textured implants. 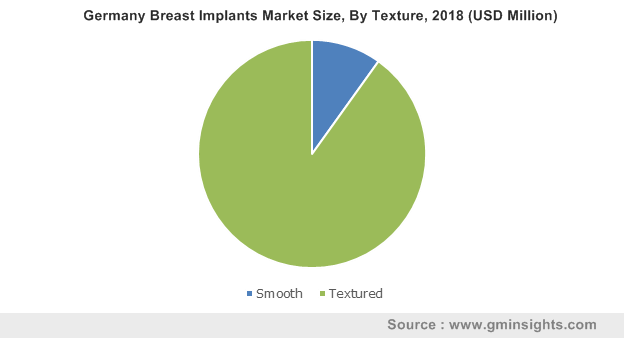 In addition, increasing demand for breast reconstruction and rising incidence of breast cancer will spur textured implants market share in the forthcoming years. Smooth texture breast implant market will grow at a CAGR of 10.2% during the forecast timeframe. These implants have lesser chance of rippling after its placement and give more natural look. Smooth implants are long-lasting and are less expensive as compared to textured breast implants. Also, lower risk of suffering from breast implant-associated anaplastic large-cell lymphoma than textured implants will drive the preference and demand for smooth breast implants in foreseeable future. Clinics end-user segment was valued above USD 1,008.7 million in the year 2018. Increasing number of plastic surgeons operating coupled with growing number of private clinics. Clinics conduct breast implant procedures in shorter duration that should drive the demand for such procedures in these settings. Additionally, availability of skilled resources and advanced products will increase breast implantation procedures at clinics and thereby impel clinics segment size in the forthcoming period. Hospitals end-user segment will witness lucrative growth at 10.3% CAGR over the forecast timeframe. Hospitals as a healthcare setting provide a wide variety of diagnostic, curative and rehabilitation services. Hospitals are much larger as compared to clinics and ambulatory surgical centers as well as have a well-organized medical, nursing and other healthcare professional staff. Hence, greater safety and care provided in hospitals will further boost influx of patients for breast implantation procedures in hospitals over the coming years. U.S. dominated the North America breast implant market in 2018 with USD 699.6 million revenue size. High regional share can be attributed to growing trend of undergoing breast augmentation procedures for breast enhancement. Also, accelerating adoption along with growing expenditure on cosmetic procedures should augment U.S. breast implants business growth. Furthermore, rising adoption of innovative product, sophisticated healthcare infrastructure and growing awareness about breast implants should boost U.S. breast implants industry growth over the projected timeframe. Brazil market size will witness significant growth at 11.0% CAGR due to presence of strong beach culture and openness regarding plastic surgery. Rapidly improving healthcare infrastructure along with rising number of plastic surgeons should serve as high impacting factor for Brazilian breast implants market growth. Growing per capita expenditure and lower cost of implantation procedures will further accelerate the demand for Brazil market growth over the upcoming period. Some of the prominent industry players include Allergan, Groupe Sebbin, GC Aesthetics, Mentor, Sientra and Polytech Health and Aesthetics among other players. Industry players are adopting various strategies such as acquisitions and new product introduction to strengthen their market position and expand their product portfolio. For instance, in September 2016, Allergan received FDA approval to market NATRELLE INSPIRA cohesive breast implant, that will enhance its product base. Breast implants industry witnessed a turmoil with the changing regulatory scenario regarding the safety and availability of silicone-gel based breast implants since 1976. Further product development led to submission of Pre-market approval (revised requirements) for breast implants from Allergan and Mentor companies. In 2006, the US FDA approved silicone gel-filled breast implants for breast augmentation procedures. Since, the breast implants industry is highly competitive in nature with continuous novel product developments and strategic alliances to earn profitability. Industry players are engaged in rigorous R&D for launch of new implants and material technologies. In the foreseeable future, Asia Pacific, Middle East and African market will offer lucrative market growth opportunities owing to the changing perception and awareness about cosmetic procedures.